Yes, I sound old, what with saying fashioning and all. 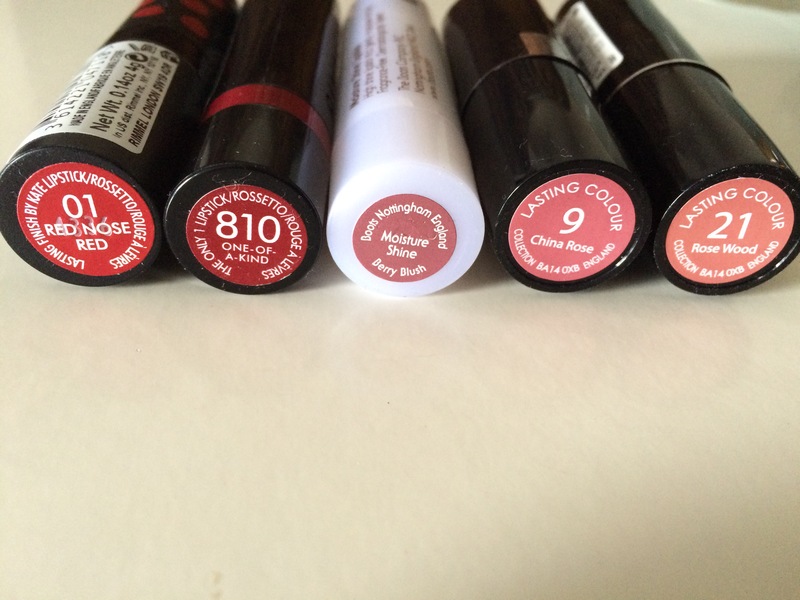 However, I am young and fabulous and am obsessed with lipsticks. I’m not sure what happened but during recovery I have just switched and all of a sudden I want to wear lipsticks day and night. I’ve always loved red lipstick but have never really dared to wear it. During these past two months, however, I’ve come to realise how much I suit it- cue purchasing red lipsticks. However! I also want to explore and as much as I love a red lip, they don’t go with everything. Therefore, I’ve been making purchases in more pinky, peachy and nudey tones. I really like them and they give quite a nice soft look instead of offering a statement. Now, I’m not really fussy with brands. I can’t afford a lot so my lipsticks have been purchased from superdrug and Boots, hell even Morrisons and they are all £5 or under. Let’s start from the left, both products on the left are from Rimmel, the middle is from the Natural Collection and the two right are from Collection. I haven’t really gone for each product based on their longevity but their shade. 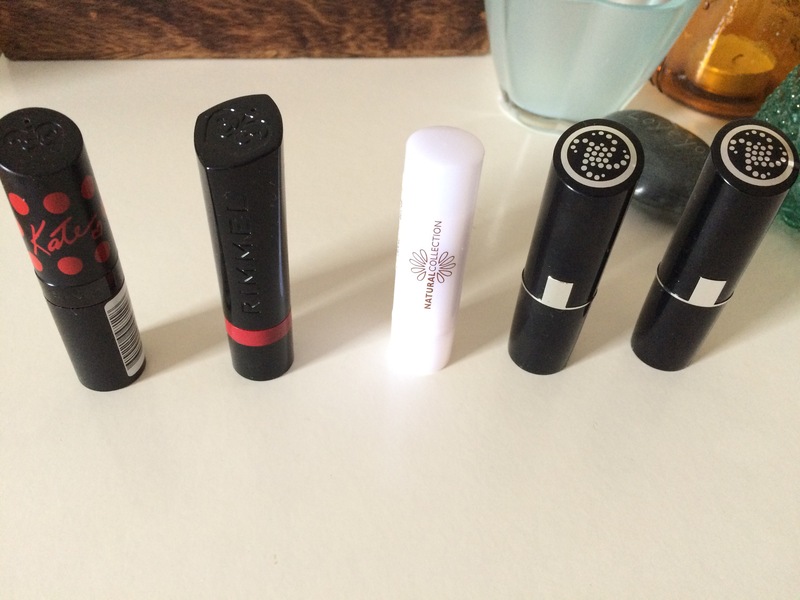 I will say though, that I have found that the two Rimmel lipsticks offer a more matte finish than the rest. I think with each one you do need to moisturise your lips with a little bit of lip balm first just to give a nicer finish. 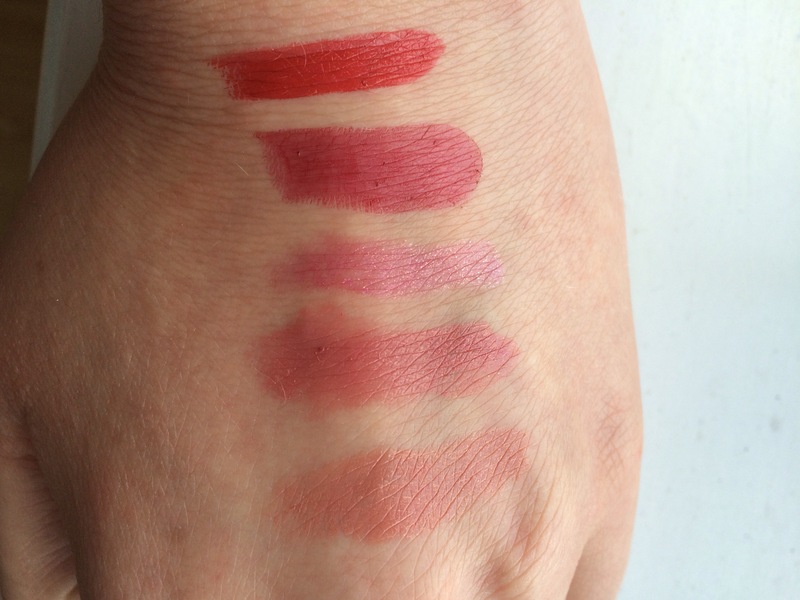 Starting from the top: 101 Red Nose Day – Lasting Finish by Kate (Rimmel), 810 (Rimmel), Berry Blush – Moisture Shine (Natural Collection), 9 – Lasting Colour (Collection) and 21 – Lasting Colour (Collection). Has anyone else purchased any of these? What do you think? The Boyfriend’s Mum’s Birthday Meal! Two days ago it was my boyfriend’s Mum’s birthday and whilst the men were at work, his mum and sister invited me out for lunch. We went to Le Bistrot Pierre which is a lovely french restaurant in a village near to us called Stockton Heath. They are a chain of restaurants and I’d heard it was good but had never eaten there before so was quite intrigued! There was a great deal on the menu too which offered two courses for £10.95 and so we opted for that, sticking with water for drinks (I know, crazy right?!). After scrolling down the menu and vetoing steak (I really wanted it but need to watch how much red meat I eat with my one little kidney now), I chose the Porc rôti which was a hefty piece of pork, with a lemon, rosemary and parmesan crust. 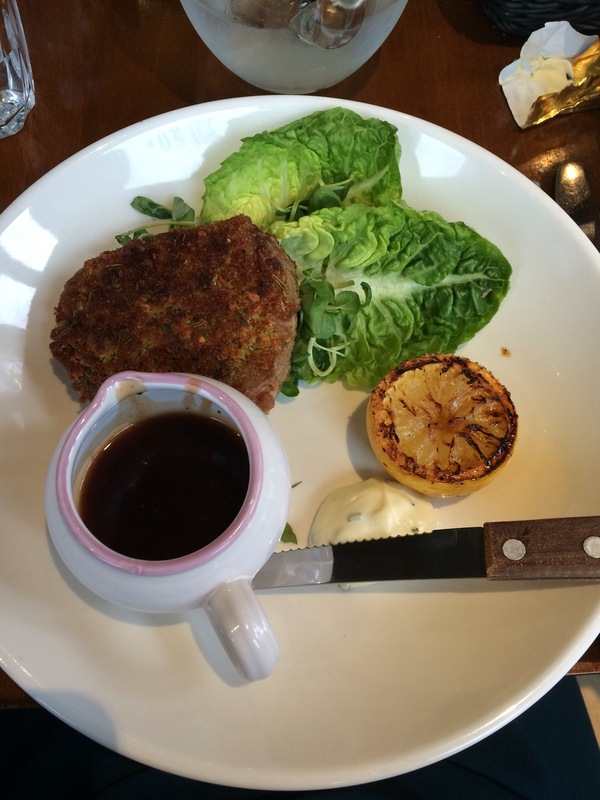 It was accompanied by herb aïoli which is like a garlic and herb mayonnaise and it also came with a jus for the meat. I decided to have chips with it too which were lovely, crisp and thin. Iain’s (the boyfriend) Mum and Sister went for the Steak-Frites which looked really good! After filling our bellies with main we decided that a meal out wasn’t a meal out without dessert and took our time carefully choosing. Eventually, we had decided. Iain’s Mum chose to have the Poêlée de poires et pommes which is an almond crumble filled with apples, pears and berries. It’s also topped off with ginger icecream. I know, right. Iain’s Sister decided to have Pain perdu brioché which is bread and butter pudding with french bread and it’s served with a berry compôte and vanilla ice cream. But what did I have? Well, I went all out. I went for the most chocolatey dessert anyone could wish for- Délice au chocolat. 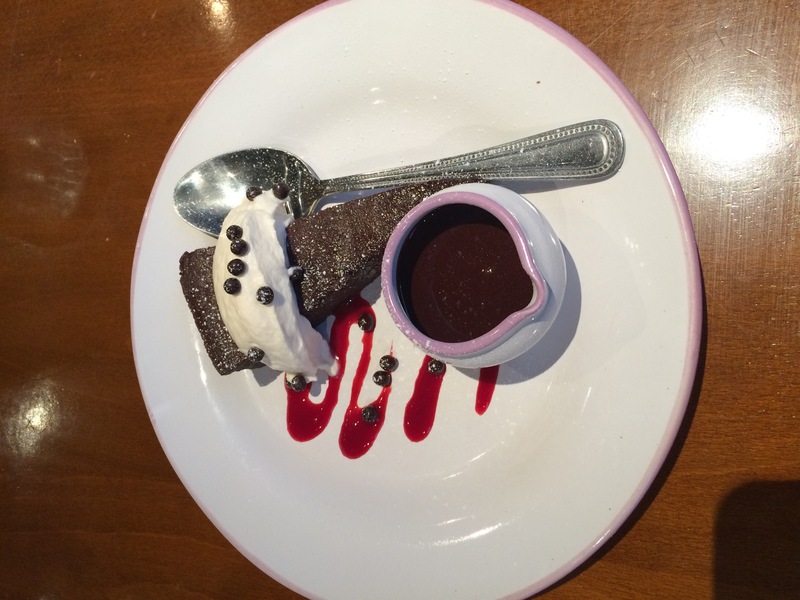 It was a chocolate torte with Chantilly cream and a hot chocolate sauce. Needless to say, it was devine. Overall though, it was a fab day! 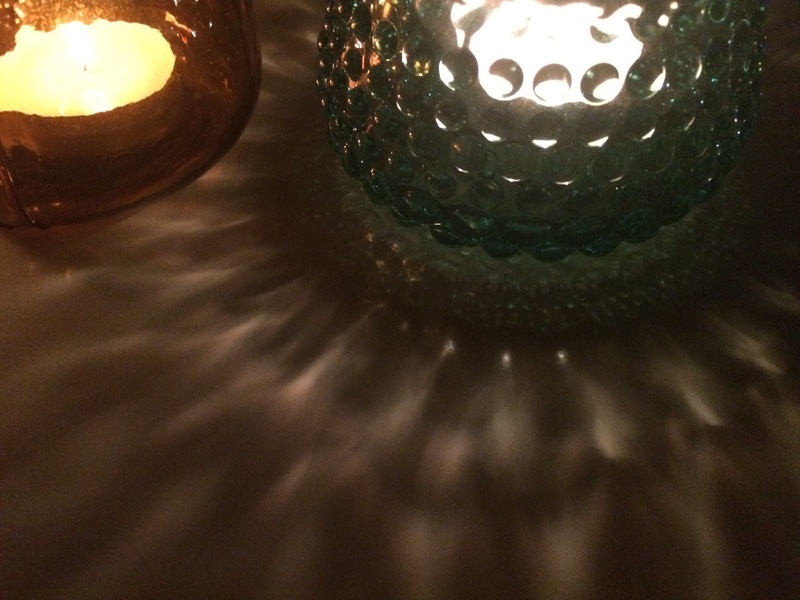 Has anyone else dined at Le Bistrot Pierre?? What did you have? I have a confession. 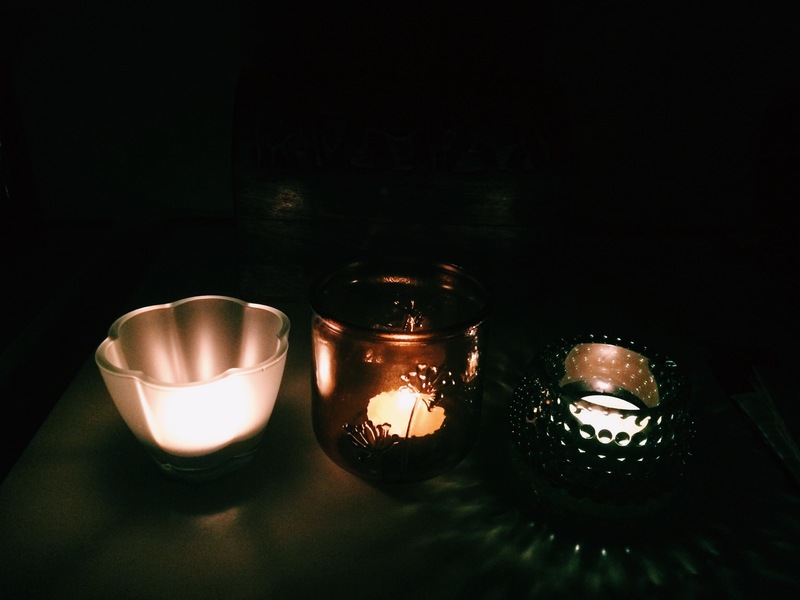 I am obsessed with candles. It started harmlessly when I moved into my flat about two years ago. I didn’t have them on a lot, they were reserved for special meals or for when guests came round. This carried on for some time and even in October of last year, I rarely had them on. But then Christmas happened. I became obsessed. I loved the atmosphere they created, the smells they produced…the glass jars, the accessories you could purchase with them…I couldn’t resist. 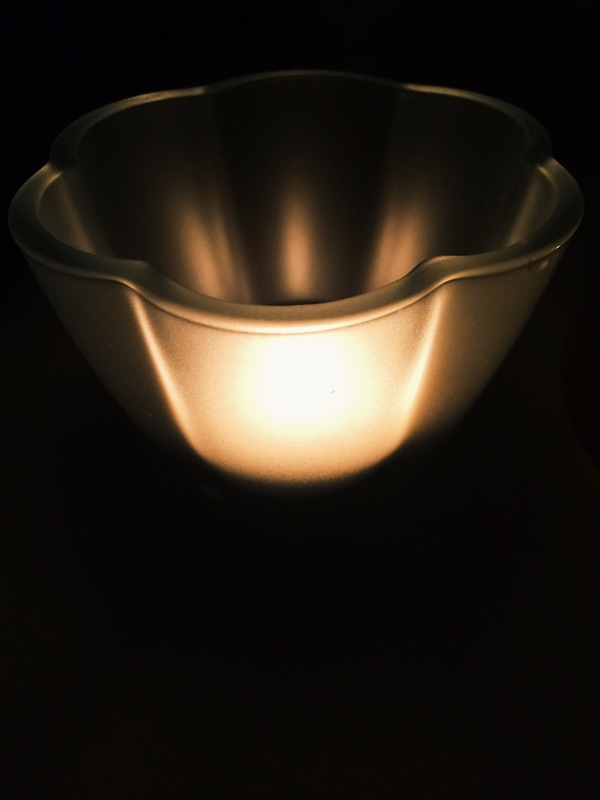 After already having a range of Yankee candles that had sweet, rich scents, I turned to tea lights. This way I could offer a warm glow in pretty little glass jars, I could colour match, I could play Interior Designer. I purchased a lot of tea lights and my mother fuelled my obsession- cranberry scented, apple and cinnamon, the list goes on. It was time therefore, to give these little lights a home. Last Monday, I innocently strolled into Next, not intentionally looking for tea light holders but there I found myself, staring at them all. I searched high and low and quickly snatched up three beautiful ones. I opted for hues of blues and oranges as this went nicely with our ornaments and overall feel to our little flat. I didn’t want anything that said Love on or Shine Bright as this isn’t really my thing and I much prefer patterns- I also have to consider the boyfriend! So, there I stood at the till point with three glass tea light holders. I paid under £8 for the three and could not be happier. They feel like they are very good quality and the burnt orange holder is made from recycled glass. I was so surprised by the price as I feel Next is notorious for being pricey but I’m finding their home ware to be reasonable and modern. I think it’s a great place for just adding little touches to your home and you know the quality will be excellent. 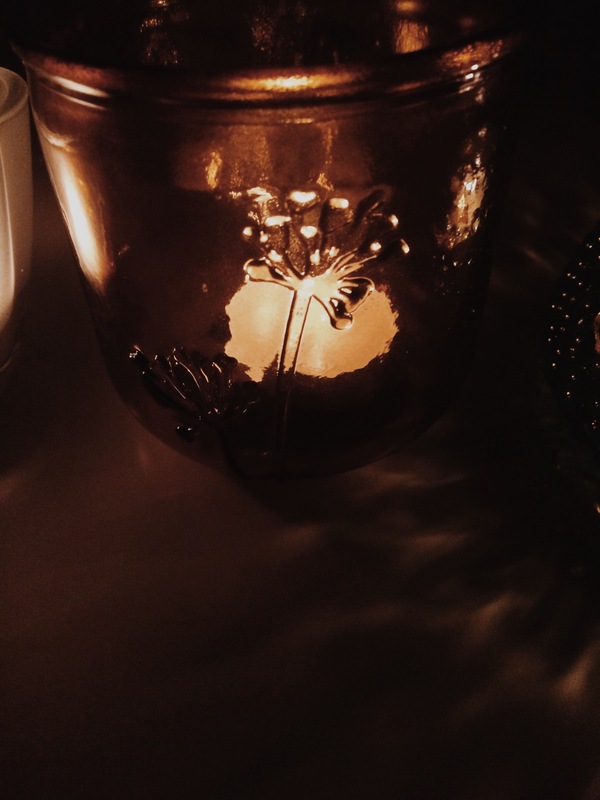 Have you also got a candle obsession?? Marilyn Hair Treatment- Lush Review! Last night, after being in bed with some sort of tummy bug all day, I decided to do a hair mask. One wonders why but the truth was I felt better and wanted to wake up feeling fabulous- perhaps the hair mask would cure me of my bug. 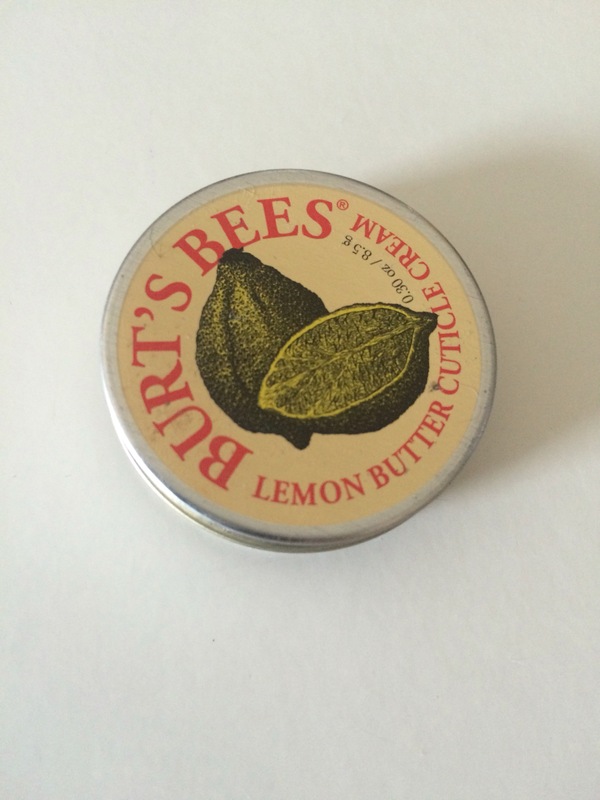 I’d had two sample pots of Lush’s Marilyn lying in my basket in the bathroom for months. I actually think I got them in August. Yep, I tend to forget about sample pots. In fact, yesterday, I’d had enough and managed to use about eight of them up (I also decanted some into other pots). I’d heard good things about Marilyn, how it was great for blonde hair. Now, my hair isn’t really blonde. Well, it’s a dark blonde/light brown. It used to be beautifully blonde in 2014 but then my hair fell out and now I’m just rocking my natural colour with teeny strands of the old blonde here and there. I had loved my blonde hair and wanted to see if this would make it any lighter. 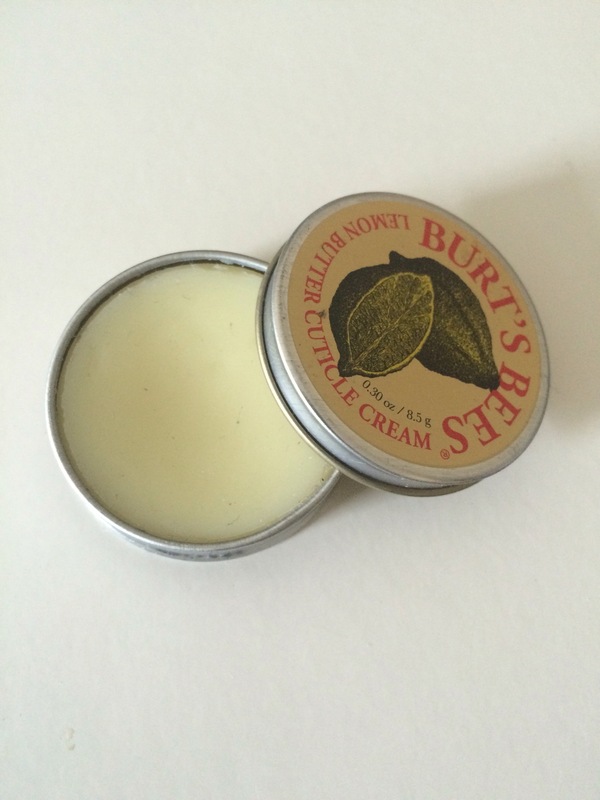 Let’s start with the feel and smell (I’m not going to talk about pricing or packaging as this was a sample). So, it’s quite a runny consistency. I always using H’Suan Wen Hua which is very thick so this took me by surprise. I did think that this may make it easier to cover my hair but I actually found that it didn’t get very far- perhaps I should have asked for more samples. It didn’t feel heavy on my head though as I waited for twenty minutes which was great! It sounds silly but some of you may know what I mean? Now, the smell was lovely. I didn’t find myself wishing the time away so I could wash the smell away but then, she do you ever with Lush? I have to say though, that I wasn’t overjoyed with the smell. Not like with H’Suan Wen Hua- I actually want to eat my hair when that’s on! When it did come to washing it off, I decided to use up another sample pot- this time it was a sample of the Rehab shampoo. This is really similar in consistency to Marilyn and I was really happy with how it reacted with my hair! I had tried this a few months ago but I didn’t really rate it, perhaps I just needed thicker hair though. Anyway, this morning my hair is super soft. It doesn’t feel thicker or look blonder (perhaps you have to use this over a longer period of time?!) but it is a lot softer. Then again, it could have been the shampoo. I don’t think I would purchase this yet. When I’ve started dying my hair blonde again I’ll probably try it again but I think for now I’ll stick with H’Suan Wen Hua. Has anyone tried Marilyn? What are your thoughts? 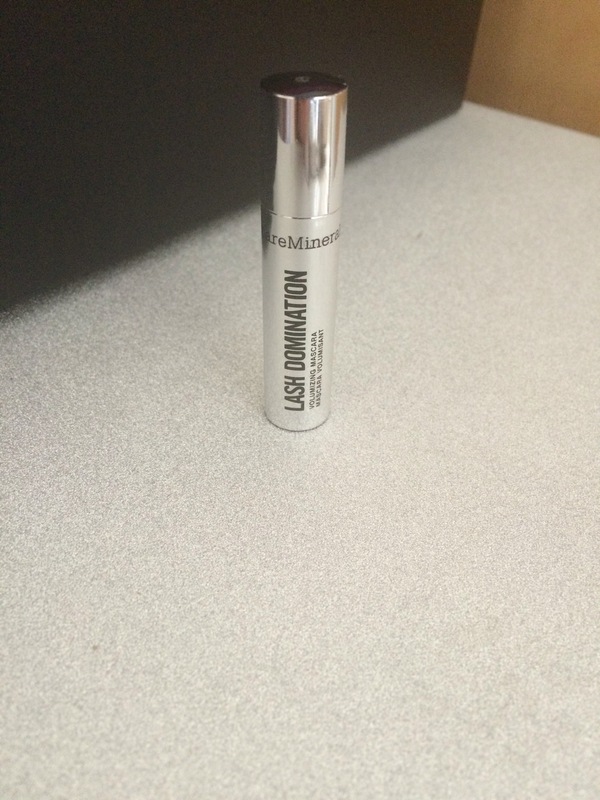 I’ve never really owned a product like this before and at first I wasn’t sure how it would work for me. They can look a bit daunting at first as they are so thick and give a good depth of colour and you wonder about how difficult it would be to a) make a mistake and b) easily rectify said mistake. 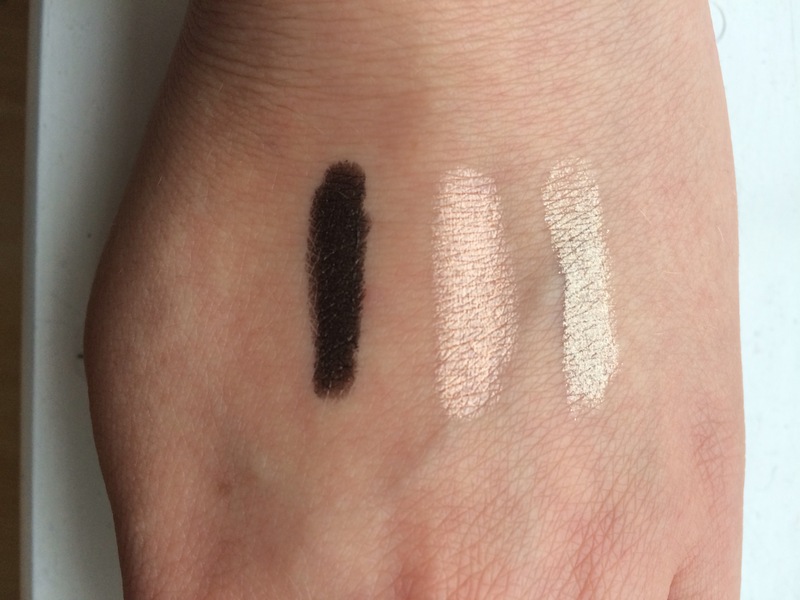 Anyway, the colours I purchased were Dark Horse (left), Conspire (middle) and Deviant (right). 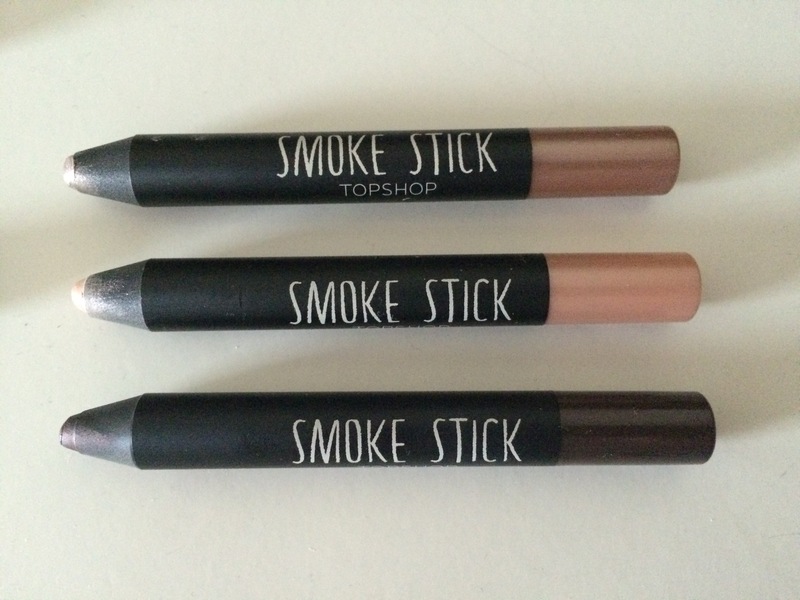 I feel that the smoke sticks offer colours which you would associate with a smokey eye even though I feel that these are harder to blend with eyeshadows to reach that effect. 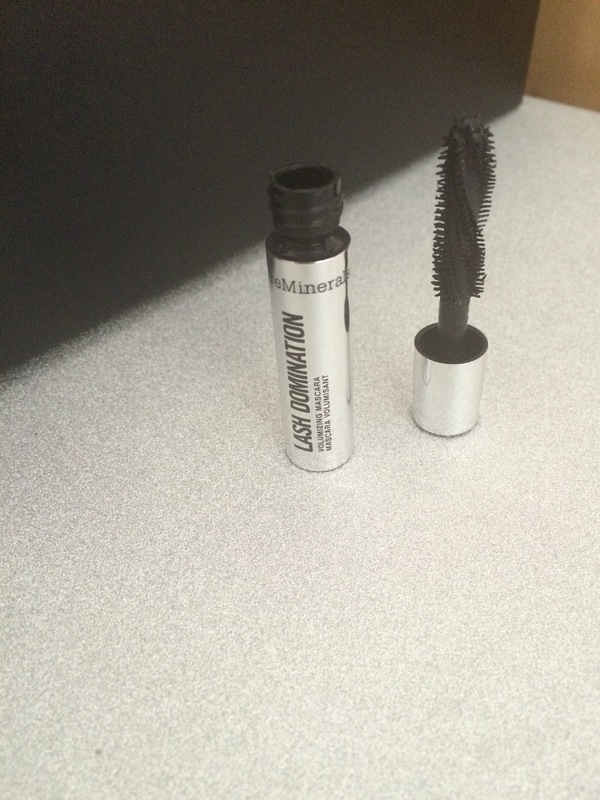 They make a wonderful base for your eyeshadow though, if you want it to pack that extra punch! I also think they are fantastic for lining the corner of the eye for a bit of extra sparkle too, or just under the lash line but I would prefer to use the darkest shade for that. I feel that these wouldn’t quite be the best thing for just a natural look because of the statement they make but they’ll make you look hella glamorous! Sadly, I’m pretty sure that the colours of the sticks are/were limited edition as I can’t see them available to purchase as individual items which is a shame because they’re gorgeous. Has anyone else used or purchased these? What do you think about them? Do you have any tips for using them? Let me know! Not many of you will know but I am a little bit crafty, the good kind of crafty of course. Anyhoo, here I am, post surgery and currently looking to keep my hands busy (no funny business here please!). 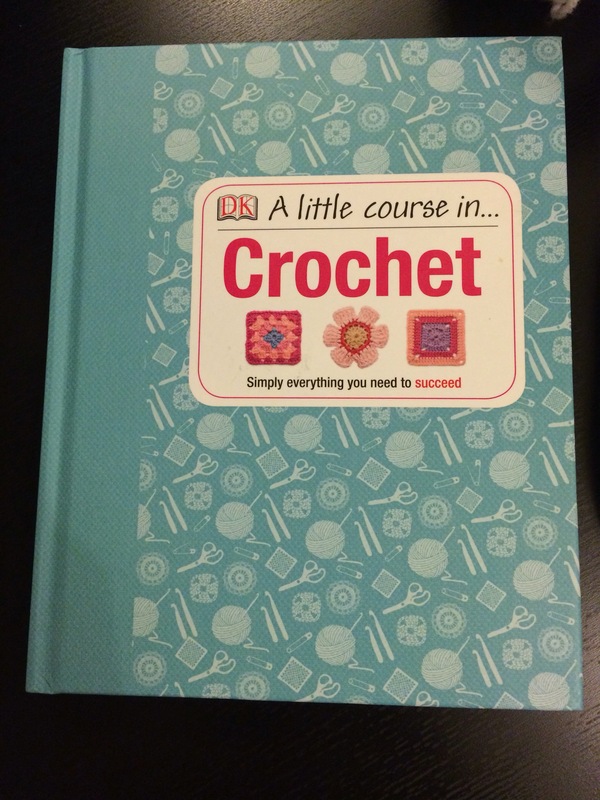 Seeing this, my boyfriend bought me a lovely book for Christmas all about crocheting! It even came with a really sweet, purple case that has all the needles in which are in different colours so it will be less confusing. I haven’t started yet but am keen to and have been buying supplies! One of the first things I’d like to make is a cafetiere cosy! I’ve never come across one and I just think it sounds brilliant, plus I can make it for my parents. I’ve only purchased 5 balls of yarn, three of which are glittery and came from pound land as they are three for two! I’m not sure about the quality but I think they will be great for starting with and they’re glittery!!! Has anyone else just started crocheting?! I’d love to see or hear about your creations! So let’s dive right in here- I have been looking for an eyeliner. After my first bad bout of illness back in 2014, I had taken the natural approach. I didn’t want anything on my face, I opted for no makeup and believed that this was right for me to do. However, after my second bout of illness I’m finding myself wanting to wear more and more makeup- huzzah! My obsession has returned! Naturally, I’m on the hunt for makeup that won’t cost me an arm and a leg but I want to look fabulous at the same time and I haven’t owned a great eyeliner in years. A few years ago I was given a No7 eyeliner pen but, truth be told, it’s a bit pants and has left me desperately trying to create an even line which just becomes thicker and thicker the more I fiddle. It doesn’t have a wonderful depth of colour to it either. Therefore, about two weeks ago, I took to google as we all do and begged the internet to show me the way. As I scrawled down pages frantically, one eyeliner that kept cropping up in ‘The Top Ten Eyeliners To Buy’ was Topshop’s Magic Liner, retailing at just £6.50 it was a bargain, right? Strutting into Topshop (I feel the term strutting will make me sound a lot more glamorous than I actually looked), I soon found the eyeliner in the sale section, accompanied by three smoke sticks. In a cute Topshop box with a pink, sparkly background, I got the lot for just £10 instead of £20- what a bargain! I really like the packaging of the Topshop liner, it’s really fun and simple. It’s not serious like some eyeliner packaging which makes me sound a little mad but I feel like you can play around with this eyeliner and be quite creative. The design of this eyeliner is by far the best thing about it though. A lovely thin base to a tiny tip- it doesn’t dry out easily and it’s incredibly enjoyable to create a thin to thick line! I haven’t quite mastered the flick yet but I know that with a little practice, I’ll soon be getting my cat eye on. Depth wise it offers a fantastic jet black and I have to say it gives quite a long wear. I will say that after a few hours it will have smudged on your eyelids so keep that compact mirror handy but it gives a lovely effect when on. I would suggest having cotton buds on hand when applying and quickly wiping away the mistakes and I would say that you need a bit of elbow grease to get this off! Overall, I’m really impressed and would definitely buy this again in future particularly as it’s such a reasonable price. I’m not going to lie, my eyes feel a bit naked without it! I hope this has provided someone with a helpful review but if you’re reading this and you already own it, let me know your thoughts!